The Caribbean is home to some of the world’s great diving spots. So, it’s no wonder that divers from across the globe flock to its crystalline waters. Home of the luxury included vacation, Sandals has developed a state-of-the-art diving program to meet the needs of its discerning guests, offering unlimited diving as part of their vacation package. The program is so good that it has been voted one of the top five dive operations in the Western Hemisphere by the Professional Association of Diving Instructors (PADI). Sandals is also the only resort chain to have all of its properties Green PADI Certified. Sandals’ highly experienced PADI-Certified staff works hand in hand with the Divers Alert Network (DAN) to ensure that guests—whether they are experienced or looking to get their flippers wet for the first time—have the dive of their lives. Guests can become PADI-certified or, for those with more experience, take advantage of a range of courses to expand their knowledge of the sea and enhance their safety skills. 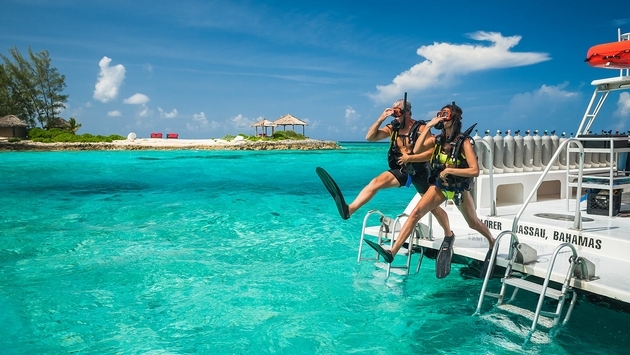 Sandals’ unlimited scuba diving includes such top-of-the line equipment as regulators, BCDs and weight belts, silicone masks and snorkels, Deep Blue fins, Luxter or Catalina tanks, optional dive suits along with underwater camera and video services. Only Sandals features twin-diesel Newton boats. These boast luxury details and amenities, including onboard freshwater showers, tank holders and a 16-foot diving platform. Guests can also take advantage of glass-bottom boat tours that provide a unique glimpse into the undersea world, or they can hone their waterskiing skills behind a MasterCraft purpose-built ski boat. Non-motorized water sports are also included at all Sandals resorts. Guests can dive up to twice a day and participate in guided dives from 20 to 90 feet. For novice divers, Sandals offers a PADI Resort Certification program (available for a nominal fee of $100) that has guests experiencing underwater wonders the same day. Meanwhile, certified divers can take advantage of the resort’s knowledgeable dive masters, who know the ins and outs of the waters off Sandals’ resorts. They will work with guests based on their interests and ability to create a dream dive experience at some of the area’s best sites, where divers can explore submerged wrecks and canyons, as well as reefs that are home to scores of rays, sharks and other aquatic life. Depending on the resort and skill level, guests staying in Jamaica can experience such underwater marvels as Stingray City (ideal for DSD divers) and the Widow Maker Cave—better suited to advanced divers. There, guests will swim through a chimney-like passage to a shallow reef, where schools of glassy sweeper hide among coral. Deep Plane, Barracuda Reef and Jamaica Wall are also popular among advanced divers. Master divers head to such spots as Middle Shoal Reef or the Point, where there’s a good chance of spotting reef sharks and turtles swimming among the coral basket sponges.